Microsynth synthesis facilities enable fast and reliable assembly of RNA oligonucleotides. Chimeric DNA/RNA oligomers, including siRNA sequences, are rapidly available from our fully-integrated synthesis robots. Furthermore you can select from a wide range of modifications to label or functionalize your RNA sequence. 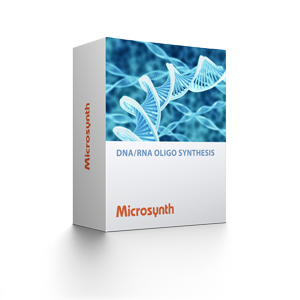 Microsynth is offering its RNA oligos at 5 different scales. For large scale synthesis please get in contact with our experts. The available standard scales are Genomics, 0.04 µmol, 0.2 µmol, 1.0 µmol and 15 µmol. As the yield and length restrictions depend also on the purification used please have a look at the tables below. 1 The synthesis scale represents the initial amount of 3' bases (starting material). 2 Our guaranteed and average yields are measured in OD and are valid only for unmodified oligos >20 and <40 nucleotides. 3 Yields indicated in nmol represent an example calculation for a 20mer. For this calculation the following rule of thumb equation was applied: nmol of oligo = OD x 100/length of oligo. Please note that this calculation is based on sequences with virtually homogenous distribution of the 4 RNA bases. 4 Oligos longer than 50 RNA nucleotides can be produced in combination with HPLC purification. To learn more about the key specifications of a modification, please look at Modifications. Overview of our DNA/RNA synthesis services.